Few topics in the construction, energy, and skilled trades have proven as popular as the green revolution. Companies in all industries are looking to get more power with less energy by upping the efficiencies of their products. This includes HVAC producers who look for ways to more efficiently heat and cool buildings of all size and stature. What have been some of the most successful energy-efficiency projects in the HVAC industry? In Florida, many air conditioners run around the clock, sucking up huge amounts of power and leaving the units prone to wear and tear. The BayView Corporate Tower of Fort Lauderdale, originally built in 1973, needed to install a total of twenty-four new HVAC systems in the building, two per floor, in order to maintain proper climate control. The company UV Resources upgraded the HVAC system to include ultraviolet (UV) lighting fixtures. UV-C units have a far better efficiency rate due to their ability to eliminate particle matter that can build up within the filtration system and air ducts, which requires more power to push through the blockages as time goes on. It is estimated that these UV-C systems can reduce the power consumption of the BayView Tower’s HVAC units by anywhere from 10 to 25 percent compared to the 25-year-old units they replaced. The Doubletree Hotel in downtown Houston found itself looking for alternate cooling solutions when the parent company announced in 2009 that their operations would slash energy consumption by twenty percent. The Houston hotel decided that they would tackle the problem by focusing on one of their most inefficient systems: the boiler system that delivered hot water to everywhere from the dishwashers to the showers. They installed HydoCal pumps, manufactured by Caleffi, which return the water to the boiler rather than requiring new inflows of water (and energy). By recycling water and heat, the Doubletree saved nearly half the energy required to do everyday tasks. Anyone who has visited Oklahoma knows that they have their fair share of energy to choose from—sunny days produce solar power, high winds run turbines, and a large supply of oil reserves allow for inexpensive fossil fuels. 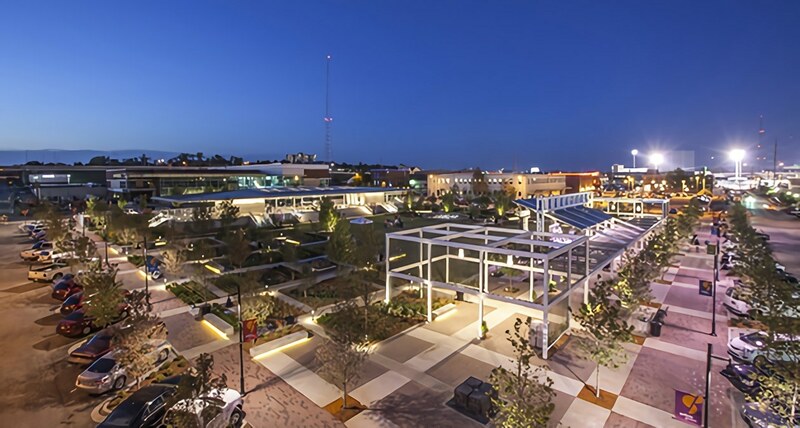 ClimateMaster decided to take a different, eco-friendly tactic to powering the Guthrie Green Complex in downtown Tulsa, supplying the building with an extensive system of over six dozen hydrothermal heat pumps. These heat pumps send water down into the earth and then re-circulate it through a building: the underground system cools the water down and delivers temperate climates during hot weather, while in colder temperatures, the water loses its chill and sends the absorbed warmth through a building. The end result provided a reduction of approximately sixty percent of the total energy usage of the Guthrie complex. What’s more, smart sensors detect when people are present in a room and shut down heating and cooling when there’s nobody around, minimizing the amount of power needed to keep the building at a stable temperature.